3532LF-SSMPU is rated 4.9 out of 5 by 9. Rated 5 out of 5 by Marsha111 from Beautiful!! 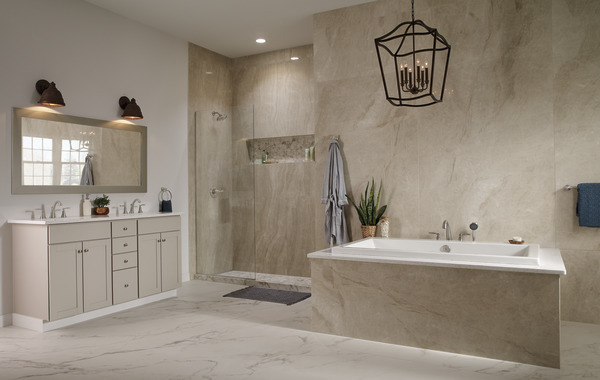 Bought this for my newly renovated master bath and it's just stunning. I love it. Rated 5 out of 5 by Wendy6 from Sleek, Functional and Affordable. The Woodhurst Delta Bathroom Faucet was actually easy to install, I love doing my own Home Improvements whenever possible. and looks lovely in my bathroom . 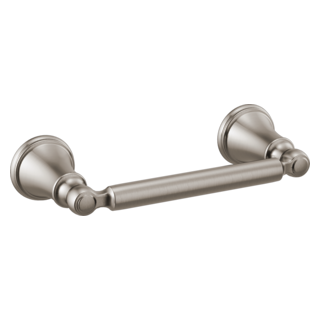 It nice chrome finish ,and a great sleek design, metal and very durable that will help give your bathroom an update but yet remain neutral and not so trendy as having to replace it every few years. Rated 5 out of 5 by AbbyZ8 from Wonderful Very nice looking and very easy to install. Looks wonderful! 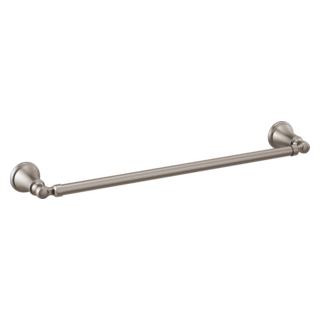 Rated 4 out of 5 by Jen4569 from Great bathroom faucet Great design features. Water runs out very smoothly. Looks very nice, very sleak design. Rated 5 out of 5 by Nakivagyok253 from Modern lines great quality This faucet was easy to install. 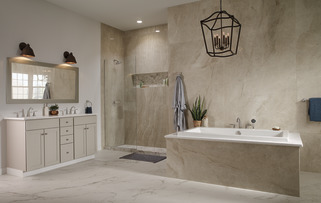 The model has modern/ contemporary lines that are very pleasing. The materials used are high quality and looks expensive! Highly recommending Delta brand and eapecially this model 3532LF-MPU. 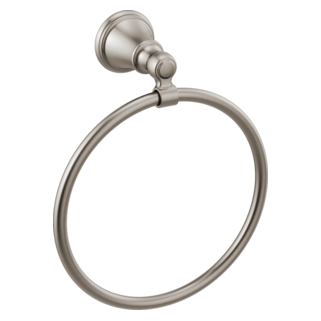 Rated 5 out of 5 by MissLynn96 from Pretty and functional I love the look of this faucet. It's a classic modern looking faucet. It looks amazing in my bathroom. The install was easy and the faucet works great. 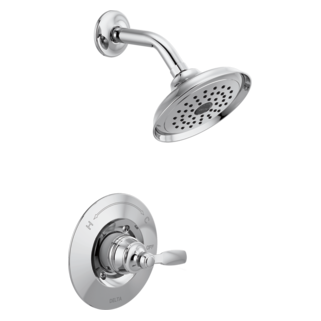 The handles are the perfect size and easy to turn on and off. I would recommend this to others. 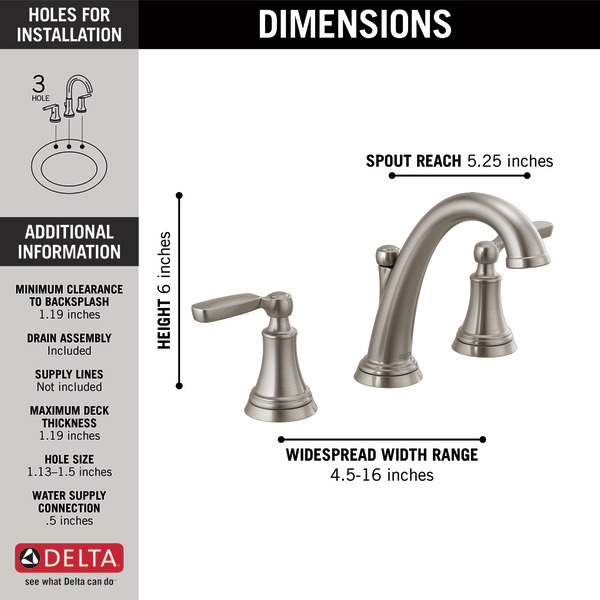 Rated 5 out of 5 by Jgarcia058 from Delta Woodhurst bathroom faucet I tried the Delta Woodhurst bathroom faucet and love it! It was very easy to install and works great. It looks so nice in the bathroom. I love the style and it has high quality pieces. The water flow is very good too and doesn’t get all over the counter. I would definitely recommend. 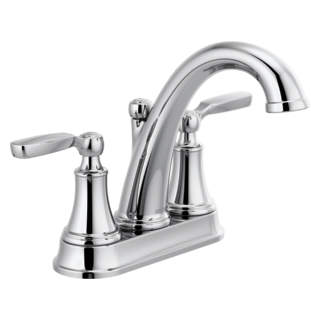 Rated 5 out of 5 by keetee31255 from Chrome faucet the woodhurst bathroom faucet chrome color is sturdy, stylish and reliable. It was easy to connect DIY. Easy for the kids to turn on and off. 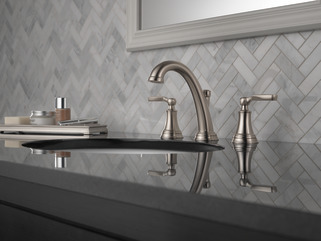 Woodhurst&trade; Bathroom Faucet Model#: 3532LF-SSMPU Love the look of this faucet. 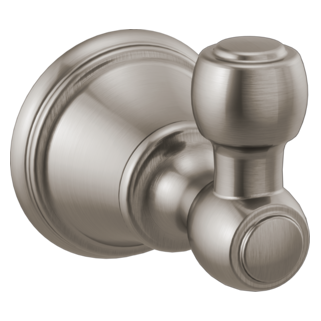 Is the &quot;stainless&quot; the same as brushed nickel? It appears to be in the pictures but I need to verify before ordering it. 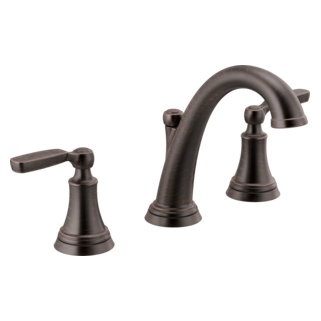 I need to replace mini-widespread delta faucet 4530-NPLHP. 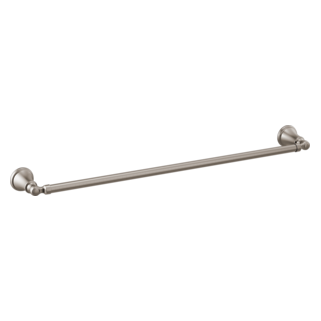 will this faucet fit in the 3 hole that the mini-widespread fit in? does this faucet have hot and cold labels on the handles? 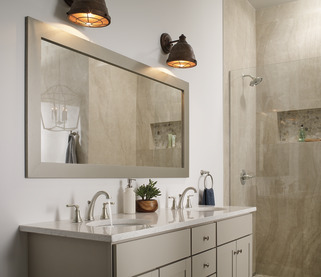 are white porcelain handles available on any of your wide set two handle bathroom sink faucets and on shower controls? Does the Woodhurst 3532LF-MPU come with the pop-up AND the lift rod?